For MORE videos and NEWS on the Bambi Bucket, click here. When the Bambi Bucket went into production in 1983, its Canadian inventor, SEI Industries founder Don Arney, couldn’t have possibly foreseen that his big orange bucket would become a brand name synonymous with helicopter firefighting worldwide. Arney’s legendary bucket has been pictured on more footage around the world than any other firefighting tool, with the exception of the helicopter itself. International news cameras have long zeroed in on the distinctive orange globe delivering a dense column of water onto a raging fire below. It’s an image that has been broadcast from natural disasters like Hurricane Katrina to enormous fires like the ones that savaged Australia in 2007. The original Bambi Bucket was introduced by SEI Industries Ltd., in 1982. 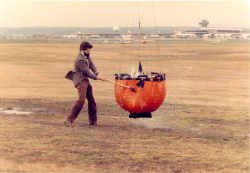 Back then, fire fighting buckets were not new but what SEI was able to perfect was a collapsible bucket with pilot-controlled valve and delivery of a concentrated column of water from the helicopter to the fire. A fantastic demonstration of how Don’s Bambi Bucket works! Rotorcraft Pro Media Network brings you SEI Industries Ltd. from Heli Expo 2019 in Atlanta, GA. The development of this innovative aerial firefighting technology was a culmination of valuable feedback from helicopter operators as well as Canadian and American forest and land management agencies that use helicopter firefighting equipment to protect remote areas from fire. Today, more than 30 years later, SEI services more than 90% of the world's aerial firefighting water bucket market. Globally, the Bambi Bucket brand is known amongst firefighting agencies and it has become synonymous with aerial firefighting. The legendary Bambi Bucket is now used in more than 115 countries around the world by more than 1,000 helicopter operators. In May 2017, Don was inducted into the National Inventors Hall of Fame for his invention of the Bambi Bucket. “Here I am back in the early days, trying to do damage to a Bambi Bucket using an axe! I couldn’t damage the bucket given that it’s like trying to wack some jello – it just gives to the blow. This resilience works very much to the Bambi’s advantage when it bangs into stumps and rocks etc. while suspended from the helicopter. You can imagine what would happen to a fiberglass bucket in such a scenario,” notes Don. At Fukushima after the catastrophic tsunami in 2011 Bambi Buckets were used by the Japanese military to douse water on the country's dangerously overheated nuclear reactors until ground access could be gained. In 2014 the Bambi Bucket starred in a Canadian Tire Extreme Tire Test commercial - click here to see the full video. Read more about the Bambi Bucket on the SEI Industries website.